Cookie jars have their origin in British biscuit jars which they have used since the latter part of the 18th century. Cookie jars as we know them today were only popularized in the U.S. around the time of the Great Depression in 1929. Early American cookie jars were really glass jars which were made with metal lids which screwed onto the container. Subsequently in the 1930s, stoneware became predominant as the material of choice for American cookie jars. Early cookie jars typically have basic cylindrical shapes and were often painted with floral or leaf decorations. The Brush Pottery Company of Zanesville, Ohio is typically recognized as producing the first ceramic cookie jar, in the color of green and with "Cookies" on the front; most Brush cookie jars are marked Brush U.S.A. 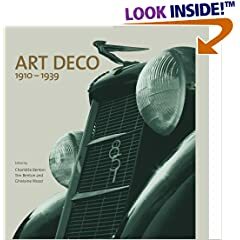 Most all manufacturers followed the move to ceramics in the late 1930s, and design exploration became much more innovative as cookie jars began to be produced in figural shapes and in the shapes of fruits, vegetables, animals, and other whimsical interpretations such as the Hull LIttle Red Riding Hood. The golden period for American cookie jar production centers on the years from 1940 until 1970, with several manufacturers rising to prominence. 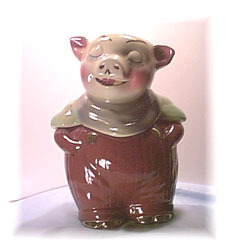 McCoy cookie jars produced in Roseville, Ohio are highly prized by collectors. 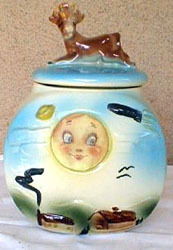 McCoy made cookie jars from about 1939 until production ceased in 1987, and the very first one produced is today one of the most valuable-- the "Mammy" cookie jar. McCoy also made a huge variety of fruit and vegetable jars, and most are embossed with McCoy on the bottom. American Bisque of Williamstown, West Virginia is recognized as another top U. S. manufacturer of cookie jars from just after the depression. They are particularly well known for the cartoon characters which they translated into cookie jars, and most are marked on the bottom U.S.A.
Other well respected U.S. manufacturers of cookie jars include Red Wing of Minnesota, Metlox of California (maker of the highly sought Little Red Riding Hood), Abingdon Pottery of Illinois (maker of the Mother Goose series), and Shawnee Pottery of Ohio. It should probably be noted that the auction of Andy Warhol's collection of over 125 ceramic cookie jars in a fascinating variety of shapes and figures rekindled interest in collecting cookie jars and greatly expanded the market. Most of these cookie jars Warhol purchased at flea markets, just like many collectors today. At an auction of his apartment's contents in 1987, Warhol's collection of common, everyday cookie receptacles brought an incredible $250,000. Buy period vintage and antique cookie jars on the Collectics Kitchenware pages, or search the entire site for great antiques, collectibles, and crafts for every collector!